With the Management Improvement Method ‘’Show Your True Colours’’ you discover with ease and within a short period of time, the talents of each student. The educational program provides insights into personal qualities and how they influence each other within a team. Recently, Earth Charter and SDG (UN Sustainable Development Goals) related situation cards have been added to Show Your True Colours. Here the principles of the Earth Charter and SDG’s are related to practical situations and linked to the personal qualities of Myers & Briggs and Jung. The strength of the Show Your True Colours in education lies in the combination of elements of Myers & Briggs, Jung and successful coaching format Inner Sense. 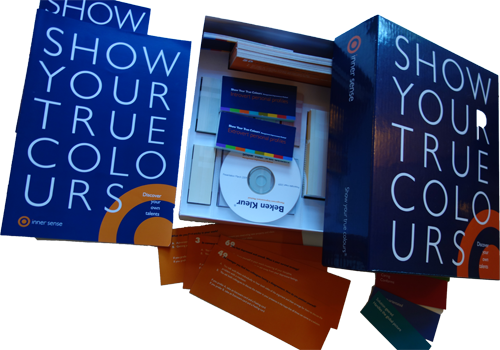 Show Your True Colours improves insight into the personal talents of students / team members in order to perform better and collaborate more efficiently. With the Earth Charter related questions the Show Your True Colours education method gives practical insights into the applicability of the principles of the Earth Charter. Show Your True Colours is played by means of practical work situation cards which are linked to personal qualities. In the foreseeable future, for all team members clear about their individual qualities and pitfalls. Sustainability training ’’Show Your True Colours’’ at your University? A training of the Earth Charter Version of Show Your True Colours Method can take place at your University. The Earth Charter Show Your True Colours workshop is an interactive session during which participants play the Show Your True Colours game that is modified with Earth Charter and SDG values. The session allows the participants to look at different situations from a variety of perspectives derived from the principles of the Earth Charter and SDG’s and related to concrete examples. Students learn to think and act in a more sustainable way. An assessment of personal qualities of individual participants leads to them identifying specific principles of the Earth Charter and enables both the teachers and students to define follow-up actions through dialogue. In general, the personal insights from participants encourages them to think about actions they can take regarding environmental conservation and increases and improves communication with other people, communities, and the Earth itself. a personal profile related to the SDG’s, a more sustainable mindset. awareness of general strength and point for personal improvement. awareness of general strength and point for development of the team as a whole. a sketch of the personal profile including three points for development. a sketch of the team profile incorporating three points for development of the team. A course at your institution? A introduction workshop for your team is possible at your location. In half a day, maximum 8 lecturers will play the game. Resulting in a better understanding of the game, an individual MBTI profile connected with the best fitting SDG's, as well as a team profile.